Here is where I get to brag a little bit. This artist is not only my friend, but the woman who taught me the way of the letterpress. 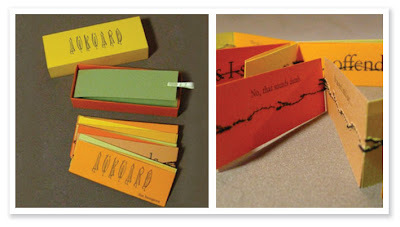 Ilfant Press' Lisa Hasegawa's Awkward book has always been a favorite of mine. She is not afraid to admit that she is not polished and sometimes lacks confidence - something most of us can relate to but try ever so hard to hide. Come on, don't deny it. Did I mention Lisa has an Etsy shop?